This past SATURDAY, SATURDAY, SATURDAY! At the Earl Warren Showgrounds' circular arena, Santa Barbara's own Mission City Brawlin' Betties squared off against visitors Central Coast Roller Derby's SLO Slammers. It was a fight to remember with nearly every seat in the house taken, leaving standing room only, which was the only way to go if you wanted to take in all of the action and were too late to get a front row seat. 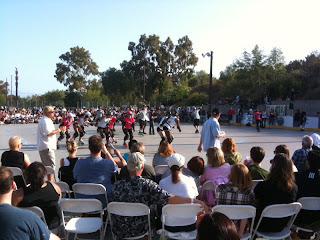 It had been years since I had last seen a roller derby, possibly thirty. I was visiting Santa Barbara from Akron, Ohio and on Saturday morning television following Gumby and followed by monster Kung-Fu movies roller derby was on. From what I can remember, there was a steeply inclined ring, possibly men were on some of the teams, and definitely a late seventies vibe to the look of all of the participants and audience members. I loved it. I also had no fricking idea what the hell was going on, but all that mattered was that I loved rollerskating and enjoyed the madness. Fast forward thirty years and I am actually attending a roller derby in my hometown, with friends and a pricey cold beer. I had no idea of what to expect and even before the bout had begun, there was a whirling chaos of different colored jerseys, people who I believe were officials, and others doing who knows what. When the game finally started, that is when the confusion completely set in, but a quick reading of the program explained about 85% of what was happening. *Skip this paragraph, if you don't care how roller derby works. * From what I could gather, each team consists of five players in the ring at a time. There is one pivot, who sets the pace for the blockers, who cannot pass her. Each team has three blockers, who combined with the pivot and the other team's blocker and pivot form the pack. Behind the pack is a jammer, and the goal is for the each jammer to break past the pack on the first time through, with the first jammer to do so becoming the lead jammer, who controls the action for up to two minutes. Both jammers then struggle to speed ahead of the pack to lap them and it is on the second time through that the jammers score a point for each of the opposing team's passed pivot and blockers. ...yeah...you kind of have to be there to see it in action to get the hang of it, but once you know...it...is...on! Sort of. Some other crazy stuff goes down that I need to actually consult with someone about, since I am still kind of unsure as to what happened. I know that there is no intentional elbowing, tripping or falling in front of a skater, and there is the existence of a penalty box, but at one point, the entire team was in the ring and the next the Slammers only had two blockers. What the what? I think their jammer, their pivot, and a blocker were all thrown in the penalty box and it was open season for the Betties' own Bacon and Legs to rack up the points, but therein lies another point of confusion. I think that there is a way for a jammer to take the stars off of her helmet, put them on the pivot and the pivot becomes the jammer. I have no proof of this, other than Wikipedia saying that this happens, so maybe that is when Vino Noir or Dita de los Muertos took over to rain down the points. Rain down the points is probably not the best way to phrase the Brawlin' Betties' defeat of the Slammers, with deluge of points being a far more accurate description. The Betties won 195 to 71. Yeah, there are no typos, 195 to 71. Ouch. I have to also mention that he first half of the bout began with strategic and planned tactics to score points and play the game by the book, but something happened in the second half, when women were falling, getting knocked every which way but loose and tempers were rising on both teams and brawling and slamming became more than just their namesakes. The next Santa Barbara bout does not happen until some time in October, as the Brawlin' Betties are on the road until then. Everyone needs to attend a roller derby at some point in their life, and if the roller bug bites, you might be hooked. I am.